Elsa Viveca Torstensdotter Lindfors (29 December 1920 – 25 October 1995), better known under her professional name of Viveca Lindfors, was a Swedish stage and film actress. Lindfors was born in Uppsala, Sweden, the daughter of Karin Emilia Therese (née Dymling) and Axel Torsten Lindfors. She trained at the Royal Dramatic Theatre School, Stockholm. Soon after, she became a theater and film star in Sweden. She moved to the United States in 1946 after being signed by Warner Bros. and began working in Hollywood. She appeared in more than one hundred films including Night Unto Night, No Sad Songs for Me, Dark City, King of Kings, Creepshow, The Sure Thing, and Stargate. She appeared with actors such as Ronald Reagan, Jeffrey Hunter, Charlton Heston, Lizabeth Scott and Errol Flynn. In 1963 she appeared in the film An Affair of the Skin as the mistress of Kevin McCarthy's character. Lindfors appeared in an television episode of the first season of Twelve O'Clock High. She also appeared on television, including the 1959 episode "The Temple of the Swinging Doll" of the NBC espionage drama Five Fingers, starring David Hedison. Later, she had a recurring role on the ABC series Life Goes On, for which she won an Emmy Award. Lindfors appeared with Joseph Cotten and Ward Bond in the 1957 film The Halliday Brand. One of her last performances was in the original Stargate film in which she played the role of Catherine Langford. An original and mesmerizing stage presence, her roles ranged from Strindberg to Shakespeare to the musical Pal Joey. In 1962 she shared the Silver Bear for Best Actress award with Rita Gam at the Berlin Film Festival, for their performances in Tad Danielewski's No Exit. Among her later film roles, perhaps the most memorable is the kindly and worldly-wise Professor Taub in The Sure Thing (1985). She was married four times: to Harry Hasso, a Swedish cinematographer; Folke Rogard, a Swedish attorney and World Chess Federation president; Don Siegel, the director; and George Tabori, a Hungarian writer, producer and director. She had three children: two sons (John Tabori with Hasso, and the actor Kristoffer Tabori, with Siegel) and a daughter (Lena Tabori, with Rogard). In the last years of her life, she taught acting at the School of Visual Arts in New York, and had a lead role (essentially playing herself) in Henry Jaglom's Last Summer in the Hamptons (1995). The same year she returned to the Strindberg Festival in Stockholm to perform in the play In Search of Strindberg, which had been produced earlier that year at the Actors Studio. She died of rheumatoid arthritis at the age of 74 and was buried in Sweden. 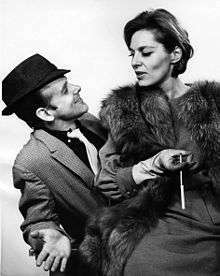 In New York City, a service was held at the Actors Studio where Gene Frankel, who had directed her in I Am a Woman and Brecht on Brecht, spoke to an audience about his respect and affection for her. ↑ Lebherz, Richard (December 21, 1970). "A Snow Queen In Exile". The News. Maryland, Frederick. p. 6. Retrieved June 25, 2016 – via Newspapers.com. ↑ "Berlinale 1962: Prize Winners". berlinale.de. Retrieved 2010-02-07. ↑ David Stout (26 October 1995). "Viveca Lindfors, Stage and Film Actress, 74". The New York Times. Retrieved 26 April 2015. ↑ "Viveca Lindfors". IBDB. Retrieved 26 April 2015. Edward Winter, The FIDE President and the Actress. ChessBase.com. Retrieved on 2009-01-20.